Back in May I was lucky enough to be invited to celebrate 100 years of Keds at ASOS headquarters in London. It was lovely to see that the brand was created with women in mind, love a bit of good female empowerment. I also learned that the term 'sneakers' supposedly came from them - the rubber sole makes for such a silent shoes, people would say they were being snaked up on ;). I met a few lovely bloggers,but in all honesty my anxiety held me back quite a bit, so that didn't help. However, there was also a few girls that were quite up themselves because they were much bigger bloggers than the others *no names* so conversation wasn't particularly flowing. Though I guess it's a possibility they also felt anxious. No? Just me? Yeah I thought so. Towards the end of the event Connie and I were getting our hair done by the lovely people of GHD - forgot to take a photo, sadly, but my hair looked so nice, Sadly because of that we missed out on some goody bags. Which was quite a shame, and the lovely Jessica, who works for Keds PR told us there were more goody bags than there were bloggers invited - bit cheeky to take more than you're given, if you ask me. However, Jessica felt really bad, so in return we got a goody bag sent to us - mine came with some Keds branded goodies, and these grey Keds Champion were one of them! Honestly (I've never owned Keds before) they're so so so comfy, I will 100% be picking up more. I've been wearing them constantly, and they're such a perfect shoe for my internship. I already have my eye on these, these and these - now time to decide! 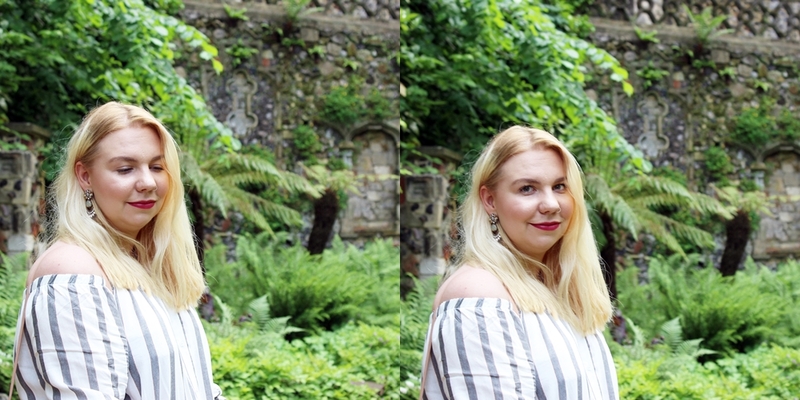 Photos were taken at the gorgeous Plantation Gardens in Norwich - post coming on Wednesday! I honestly love that place, is so adorable and such a hidden gem, I'd recommend going if you ever get the chance. I also love the bag I was wearing that day. Is by a Spanish brand 'Biba' and my Mum got it for me whilst we were on our holiday in Mallorca (you can read about that here) - obsessed with that colour, though the only downside is that it does get a little dirty, so I must invest in a leather bag cleaner, how fancy of me. This bardot top from Primark features really nice, rose gold like stitching, which unfortunately didn't pick up on camera, but I'm planning my next post around it already, so hopefully you'll be able to see it better then! I have a post scheduled on Sunday, in which I explain why I was away, plus a new blogging schedule, which I will hopefully stick to. I've been working at a PR company, so so far no summer shenanigans for me - apart from a beautiful wedding - but I'll be jetting of to Venice at the end of August, and then to Berlin the very first weekend of September. I'm having a serious case of wanderlust, and already planning a few more trips for this year - if only money allows it! How's your summer been going so far? Any holidays planned? Let me know in the comments below. I really like your shirt! And the photos are so lovely! !